Am I a candidate for Dental Implants in Temple? Daily life can be a challenge when you’re missing even just one tooth. Eating the food you would normally enjoy becomes difficult, while talking and smiling in front of other people may feel embarrassing. Did you know that your oral health is also at risk when you’re missing a tooth? The good news is that dental implants may be the right solution for you, and your trusted team at Fossum Dental Group can help! Learn here if you’re a candidate for dental implants in Temple. When you’re missing a tooth it affects all aspects of your health. Without a root, your jawbone will begin to dissolve, or resorb, which puts your remaining teeth at risk for more loss. Without a tooth, your remaining teeth will begin to shift into the open space left by your missing tooth. This causes bite misalignment and increases your risk for periodontal disease and fractures to your remaining teeth. Even one missing tooth can be a downward spiral and lead to more tooth loss. 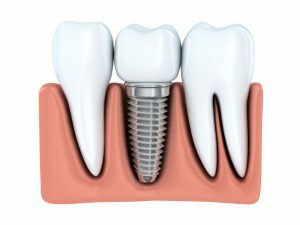 A dental implant is the best tooth replacement option that dentistry has to offer because it replaces both your root and your tooth. A biocompatible titanium post is surgically placed into your bone, which will integrate with your bone and create a firm foundation for your new tooth. Your new tooth is a porcelain crown that is custom shaded to match your existing teeth, and naturally complete your smile. With your new crown, you’ll enjoy all the function you had with your natural tooth, which means that you’ll be able to eat, brush, floss, chew, talk and smile like you were always used to doing. Best of all, with excellent home care, and regular dental checkups, your new implant has the potential to last for decades, even a lifetime in some cases. If lack of healthy bone structure is an issue for you, Dr. Brooke Elmore is able to help by performing a bone graft to build up your jawbone. Dr. Elmore is your premiere implant dentist in Temple, and she has extensive training and can handle your implant treatment from start to finish here in the comfort of our office. This is an advantage for patients’ as many practices have to refer patients out for the surgical portion of the procedure. Don’t let missing teeth hold you back from living the life you deserve when you have so many options available for tooth replacement. Contact our office today to learn more. Comments Off on Am I a candidate for Dental Implants in Temple?